In preparation for my trip to Copenhagen in August, I decided to stop by Aamanns-Copenhagen, a restaurant in Tribeca that specializes in smørrebrød, an open-faced sandwich common in Denmark. Prior to this visit, my knowledge of Danish food was extremely limited. I didn’t know such sandwiches existed, and I can honestly say that the only Danish food I’m familiar with is the Danish pastry. And according to Carl Frederiksen, the head chef at Aamanns-Copenhagen, Danishes aren’t even Danish, they’re Viennese in origin. Interesting fact: the Danish was introduced to the country by foreign Austrian bakers who brought over pastries from their homeland during a strike (source: Wikipedia). 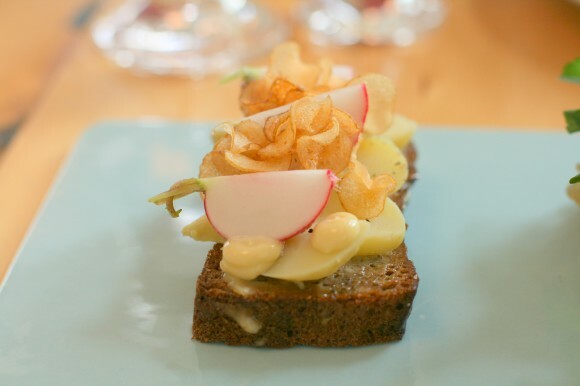 So what exactly is a smørrebrød? It traditionally consists of butter, cold cuts and spreads on top of a slice of thick rye bread. 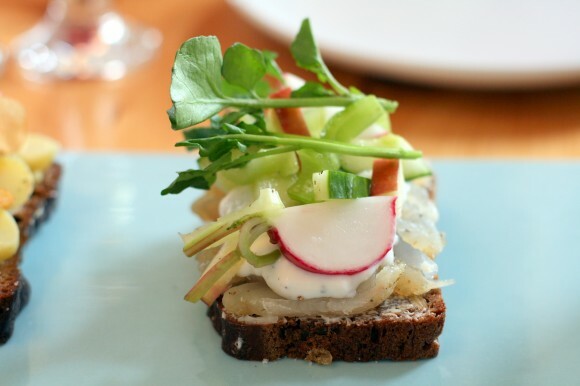 In Denmark it originated as a blue collar food, eaten for lunch by farmers and workers. Because the sandwiches were feeding people with labor-intensive jobs, they were very heavy in nature, piled high with fatty meats and mayonnaise. Aamans-Copenhagen has refashioned the smørrebrød as a slimmer, sexier version of its former self. Something that beautiful, slender Danes wouldn’t mind eating. Or slim yoga moms in Tribeca for that matter. The slice of rye bread, which is made fresh daily in-house, is pretty small, about the size of a Wasa cracker but obviously denser and slightly thicker. The toppings are arranged in rows of symmetrical patterns on top of the bread, which make for a very visually stunning presentation. Everything tasted extremely fresh–all the fruits and vegetables seemed as if they had been plucked straight from the garden, a tribute to the foraging tradition that is very trendy today. 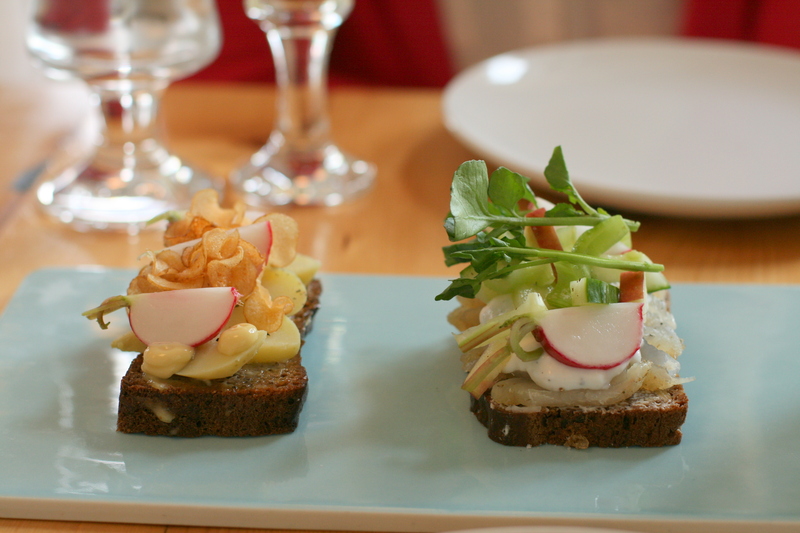 Per the chef’s recommendation, we ordered two smørrebrøds, the gravad white fish and the boiled potato. They were both light and very appropriate for the summer months. The sandwiches were a little dainty for me, and I could have done with another. I guess I’m used to humongous American portions and would feel right at home with the heartier ones back in the motherland. Chef Carl was kind enough to give me some insider tips on where to find the best smørrebrøds, and generally which restaurants to go to.